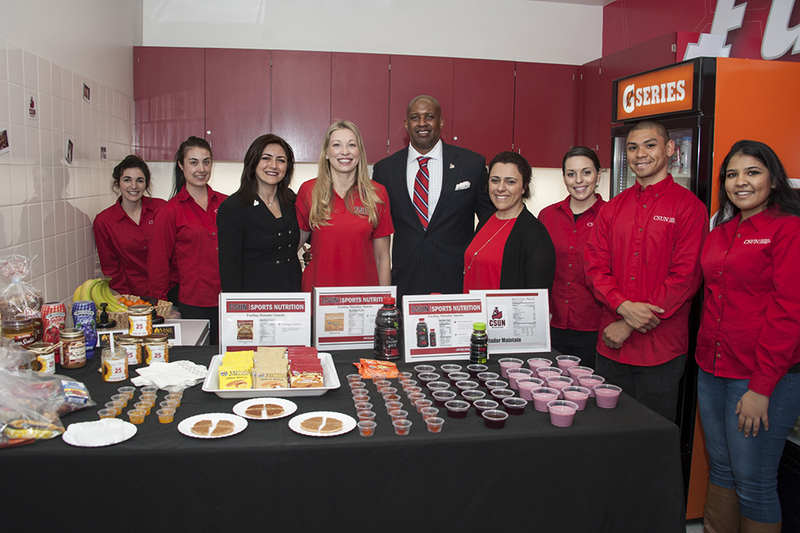 The CSUN Athletic Department unveiled the Matador Fueling Station on March 2, a project focused on fueling and energizing more than 300 Matador student athletes. Photo by Luis Garcia. Sports Dietician Simona and staff from the Marilyn Magaram Center prepare snacks and meals for athletes to have before and after practice, class and games. Photo by Luis Garcia. The food at the fueling station is rich in nutrients. 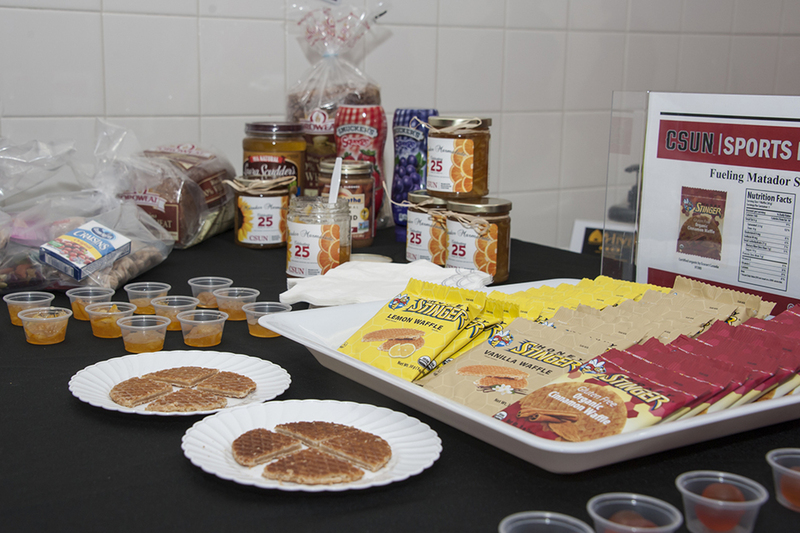 Athletes can come in to the station at any time and get what they need to fuel their bodies. Photo by Luis Garcia. California State University, Northridge Athletics showed its commitment to student-athletes’ health and wellness with the unveiling of the new Matador Fueling Station on Feb. 28. The station, the first of its kind in the Big West Conference, will provide CSUN student-athletes with a host of individualized pre- and post-workout meals and snacks, recovery smoothies and much more. 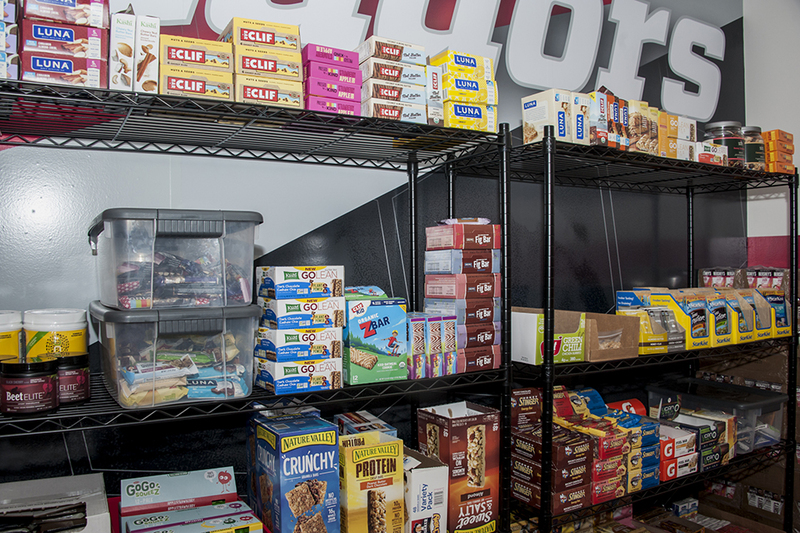 “The Matador Fueling Station will allow us to not only raise the bar in the Big West Conference, but it also addresses the nutritional and performance needs of our student-athletes like never before,” said CSUN Athletics Director Brandon Martin. The fueling station was originally proposed in 2015 and made possible by a generous gift from Union Bank. Sports Dietitian Simona Hradil M.S. ’15 (Nutrition and Dietetics) and members from the Marilyn Magaram Center in CSUN’s College of Health and Human Development make up the team that determines what is best nutritionally for each athlete. Hradil said she’s had hour-long one-on-one meetings with more than 300 of the 380 student-athletes in order to determine what foods are necessary to meet their dietary needs. Students can come to the fueling station at any time of the day, whether it’s before class or after an intense workout, and ask Hradil what food would be most beneficial. In order to determine how many calories the athletes should consume throughout the year, Hradil and her team will assess how athletes are progressing in muscle mass and fat loss four times a year by using the Magaram Center bod pod, which tests student-athletes’ body mass and composition. Guard Serafina Maulupe said the food she receives from the station, such as tuna, organic energy bars, beef jerky and a variety of fruits and vegetables, has allowed her body to recover faster and to feel more rejuvenated. “The fueling station helps us stay disciplined with what our bodies take in after a workout or practice and allows us to see what kind we should be eating,” Maulupe said. Currently, the station has served a select few teams, but will take a “phased-in approach” with plans to serve all 17 sports programs on campus in the near future.